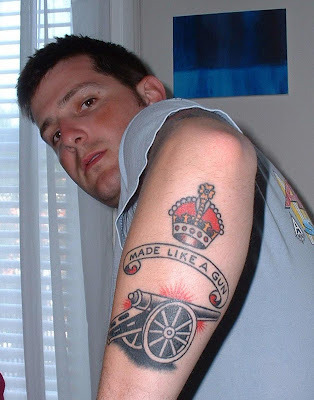 The picture of the young man with the "Made Like a Gun" tattoo comes to us from Royal Enfield dealer Peter Askey of Uncommon Motorcycles near Erie, Pennsylvania. The picture is labeled simply "Sam -- Made Like a Gun." Askey wouldn't tell us who the fellow is. All he would say is "we have loyal customers." And, yes, I asked if it was a real tattoo.